Spruce is the common name for any of the various coniferous evergreen trees comprising the genus Picea of the pine family (Pinaceae), characterized by single, needle-like, spirally arranged, leaves, each attached to the stem by a little, peg-like base; pendulous cones (hanging loosely); scaly bark; and a pyramid-shape. The term is also used for the wood of these trees. There are about 35 species of spruce, located in the northern temperate and boreal (taiga) regions of the earth. Spruce trees provide a number of important values for human beings and for the ecosystem. Ecologically, they provide habitat and food for various animals, such as the larvae of various Lepidoptera species and squirrels. The conical shape makes some spruces excellent for Christmas trees, and the soft, pliable, light, fine- and straight-grained wood makes it useful for a variety of uses, including paper manufacture, general construction, and producing certain musical instruments. Spruces are conifers; that is, they belong to the division Pinophyta, also known as division Coniferae, one of 13 or 14 division-level taxa within the plant kingdom (Plantae). The division Pinophyta consists of just one class, Pinopsida, and all living conifers are members of the order Pinales. The order Pinales generally is divided into seven families, one of which is the pine family, Pinaceae, to which spruces belong, along with pines, cedars, firs, hemlocks, and larches. 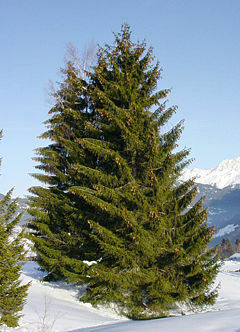 The spruces are placed together in the genus Picea. Spruces typically are large trees, from 20 to 60 meters (65 to 195 feet) tall when mature (Earle 2002), and even up to 90 meters, and can be distinguished by their whorled branches and conical to spire-like form. The needles, or leaves, of spruce trees are attached singly to the branches in a spiral fashion, each needle on a small peg-like structure called a pulvinus. The needles are shed when four to ten years old, while the peg-like base remains on the branch, leaving the branches rough with the retained pulvini. This is an easy means of distinguishing them from other similar genera, where the branches are fairly smooth. The leaves are angular or four-sided rather than flat as in the hemlocks and firs in the same pine family. The word "spruce" derives from an obsolete term for Prussia. Spruce is one of the most important woods for paper manufacture, as it has long, light, soft wood fibers that bind together to make strong paper. Spruces are cultivated over vast areas for pulpwood for this purpose. Spruces are also popular ornamental trees in horticulture, admired for their evergreen, symmetrical narrow-conic growth habit. For the same reason, some—particularly Picea abies and P. omorika—are also extensively used as Christmas trees. The Colorado blue spruce (P. pungens) is very popular in North America as an ornamental tree and as a Christmas tree. Spruce wood, often called whitewood, which tends to be light, fine- and straight-grained, tough, and pliable, is used for many purposes. These range from general construction work and crates to highly specialized uses in wooden aircraft and many musical instruments, including guitars, mandolins, cellos, violins, and the soundboard at the heart of a piano. The Wright Brothers first aircraft was built of spruce. The Norway spruce (Picea abies), red spruce (P. rubens), black spruce (P. mariana), white spruce (P. glauca), and Engelmann spurce (P. engelmanii) are important timber trees. The resin of spruce was used in the manufacture of pitch in the past (before the use of petrochemicals); the scientific name Picea is generally thought to be derived from Latin pix, pitch (though other etymologies have been suggested). The leaves and branches, or the essential oils, can be used to brew spruce beer. 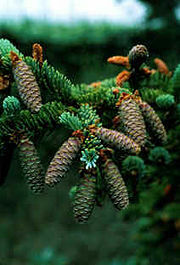 The tips from the needles can be used to make spruce tip syrup. Native Americans in eastern North America once used the thin, pliable roots of some species for weaving baskets and for sewing together pieces of birch bark for canoes. Kiidk'yaas ("ancient tree") is an unusual golden Sitka Spruce sacred to the Haida people. It was a Sitka spruce tree, Picea sitchensis Aurea that grew on the banks of the Yakoun River in Haida Gwaii (Queen Charlotte Islands), British Columbia. It had a rare genetic mutation causing its needles to be golden in color. It was revered by the Haida First Nation living on the island. In survival situations, spruce needles can be directly ingested or boiled into a tea. This replaces large amounts of vitamin C. Water is also stored in a spruces’ needles providing an alternative means of hydration. Spruce can be used as a preventative measure for scurvy in an environment where meat is the only prominent food source. Picea orientalis Caucasian Spruce or Oriental Spruce. Caucasus, northeast Turkey. Picea morrisonicola Yushan Spruce. Taiwan (high mountains). Picea wilsonii Wilson's Spruce. Western China. Brink, C. H., and F. C. Dean. 1966. Seed as a food of red squirrels and flying squirrels in interior Alaska. The Journal of Wildlife Management, 30(3): 503-512. Dallimore, W., and A. B. Jackson. Revised by S. G. Harrison. 1967. A Handbook of Coniferae and Ginkgoaceae. New York : St. Martin's Press. Earle, C. J. 2002. 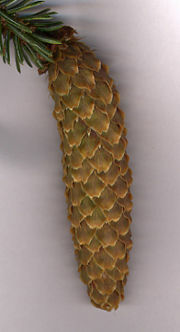 Picea The Gymnosperm Database. Retrieved December 18, 2007. Pielou, E. C. 1988. The World of Northern Evergreens. Ithica, NY: Cornell University Press. ISBN 0801421160. Arboretum de Villardebelle Picea cone photos Cones of selected species (page 1). Arboretum de Villardebelle Picea cone photos Cones of selected species (page 2).